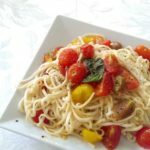 Spaghetti with cherry tomato and fresh basil pesto: One of the joys of cooking fresh pasta is that it takes only a few minutes and the Italians like to serve their pastas as fresh as possible. 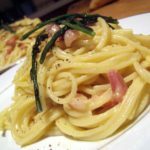 So here is a refreshing spaghetti dish that you can bring to your table in quickly. Meanwhile, in a large bowl add all the other ingredients and mix well. When the pasta is cooked, it will float to the top, test it for doneness then lift if from the water into the bowl with all the goodies in.